We live in bushfire (wildfire) prone area in one of the three most bushfire prone regions in the world (South Eastern Australia). So we have gone to a lot of trouble preparing our home and building a fire fighting system for our needs. These pages talk about that system. A word of caution, I'm no expert, these are my thoughts and opinions. My system has never been proven (and I hope will never need to be). Preparing for a bushfire is a serious undertaking so you need to make up your own mind. While we are located in a high fire risk area, our house is a spot that is not likely to experience a full fire front as there is paddock opposite and the properties on either side have cleared areas. While we have many trees close to the house there are gaps that would reduce the full fury of a fire front. However we have a very high risk of coming under and ember attack as has happened several times in the past, the last being about 10 years ago. So our planning is focused primarily on a prolonged ember attack with contingencies to survive a full fire front if it did happen. Also, we have two dogs which are often home alone. While we do love our house our dogs are living things that are dependent on us for their safety. So we put protecting the dogs higher than protecting the house. In any case, as will become apparent, this is also realistic in terms of what we can achieve. Be able to confidently stay and defend the house, with minimal damage, during an ember attack (typically 12 hours). Be able to survive a fire front accepting that the house may be lost or badly damaged. 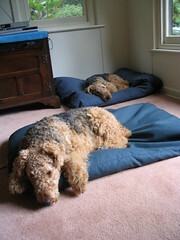 Provide protection to our dogs in the advent of an ember attack and spot fires when we are not home. Provide basic home defence to prevent embers igniting fires on house window sills and on the ground adjacent to the house, when we are not home. 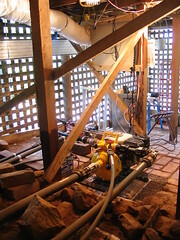 Our system is based around a petrol powered pump located under the house and fed from a 25,000L water tank. Off this we have fire hose connections at opposite corners of the house and the pump can be remotely started (over Internet) to protect our dogs and give some suppression around the house. Next to the pump is a computer which is powered from battery backed 12V supply so it can run for about a day after a power failure. The computer can control the pump, spray solenoids, web scrape for fire activity, and send SMS and email alerts. I hope to also connect up webcams so we can view the conditions around the house. The home Internet connection is also powered off the battery backed supply. Caution: While we can remotely start the pump and activate sprays around the house I doubt that a house can be reliably defended by remote control. The trouble is that the ember attack can last many hours so if you want to maintain a deluge for that time you will need a decent sized lake! How do you know when to start it? 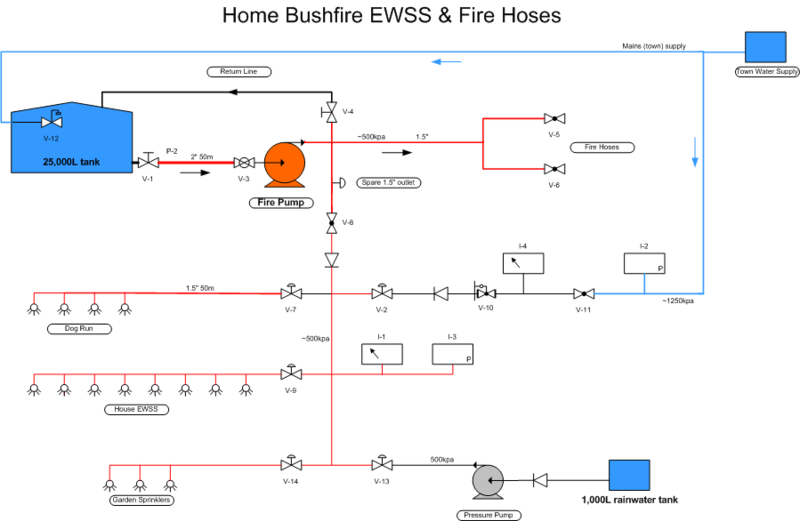 The drawing below shows the current system hydraulics. The pages below detail each part of the system. 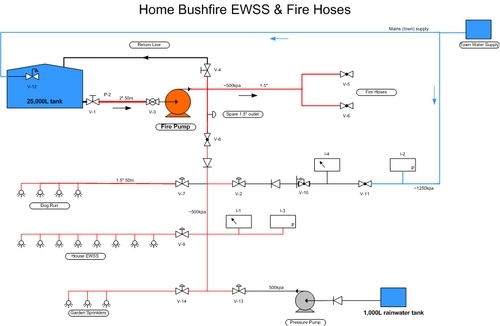 While not part of the fire fighting system, the Rainwater system connects to the fire system's manifold as the garden sprinklers are used as part of the EWSS as well as general garden watering.